Kodiak's average daily sales volume in the Bakken went up 98% to 36,100 boe/d in the fourth-quarter of 2013 from 18,200 boe/d in the fourth-quarter of 2012. Crude oil made up most of the company's sales volume at 89% in the fourth-quarter. Average daily sales volumes increased 103% for the year to 29,200 boe/d in 2013 from 14,400 boe/d in 2012. In 2013, Kodiak invested approximately $672 million on acquisitions net of divestitures in the Bakken. 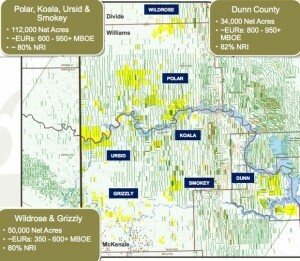 In June 2013, Kodiak Oil & Gas signed a purchase and sale agreement with Liberty Resources for 42,000 net acres in the Williston Basin for $660 million. The acquisition included acreage prospective for the Bakken and Three Forks formations in McKenzie and Williams counties. For the full year 2013, Kodiak invested ~ $1.0 billion in capital expenditures for drilling and completing new wells, including surface facilities and pipeline connections in the Bakken. In the fourth-quarter of 2013, the company completed 29 gross (21.9 net) operated wells and 40 gross (4.0 net) non-operated wells. Currently, Kodiak has 7 operated rigs in the Williston Basin. Kodiak estimates the value of its proved total reserves increased from $1.9 billion in 2012 to $3.5 billion at the end of the year in 2013. That's an 81% increase. The company's estimated proved reserves increased 77% to 167.3 million boe from 94.7 million boe in 2012. Total proved crude oil reserves are 138.2 million bbl crude oil and total natural gas reserves of 174 bcf natural gas. Of the 54% of proved reserves that are undeveloped, Kodiak estimates those properties are a 2.5 year drilling inventory.